x. Grace, b. 1614 or 1615; m. John Livermore; d. Jan. 14, 1690, Chelmsford, Mass. xi. A daughter, "youngest daughter" mentioned in will of Samuel Sherman. Edmund Sherman*s grandfather. Henry Sherman, in his will dated Jan, 20, 1590, gives "to Edmonde Shearman, the son of my son Edmonde", thirteen pounds, thirteen shillings, four pence at two and twenty. His father, in his will dated Aug. 1, 1599, gives "to son, Edmonde, after decease of my wife all the houses and lands before given to said wife and a house and seven acres called Ryes where he now dwells and my shearman’s occupation". Also authorized his son Edmond and his heirs forever to appoint a poor child to be freely taught by the Schoolmaster of the Public Grammar School in Dedhain. 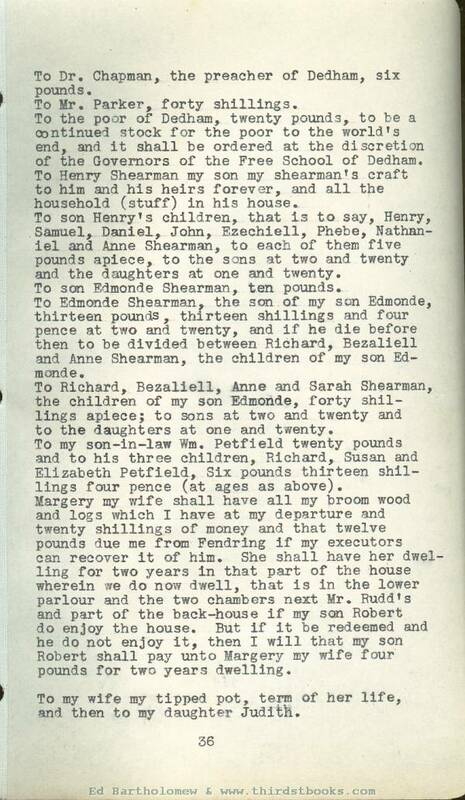 Edmund's brother Bezaliel Sherman, grocer, of Ipswich, in his will dated Oct. 7, 1618, .gives "to Joane Sherman, daughter of my brother Edmond Sherman forty pounds at the age of four and twenty years. To John Sherman son of my said brother, twenty pounds at same age". His sister Ann (Sherman) Anger, in her will dated Sept. 2, 1625, gives legacies to her brother and to Ann Sherman and Jone Sherman, "daughters of my brother Edmund". In the will of Samuel Sherman, of Dedham, clothier, brother of Edmund, dated June 14, 1643, is the following; "I give unto my sister Bacon in New England ten pounds to be sent to her or her husband in linen cloth and shoes by my cousin Edmond Sherman. To my loving sister Sherman, Edmond's widow, twenty shillings and to her son. Samuel ten pounds, to her son John Sherman twenty shillings, and to her daughters Grace and Ester Ward and her youngest daughter, to either of them twenty shillings". Edmund Sherman (VI) went to New England. He was at Wethersfield, Ct. in 1635, and later went to New Haven, Ct., where he died in 1641. His will and inventory cannot be found but according to New Haven Colony Records, Vol. 1, p. 52 "3 Mon 1641 an Inventory and will of Olde Father Shirman was delivered into Court". 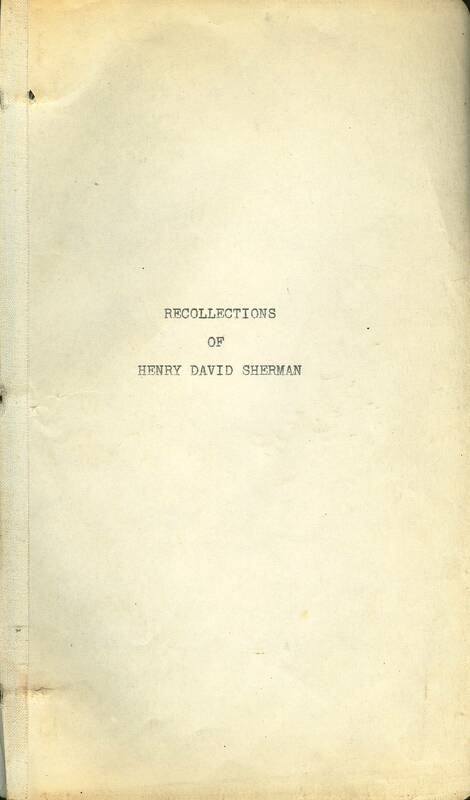 The following chapter on the SHERMAN FAMILY is written by Mr. Frank Dempster Sherman, descendant of the Honorable Philip Sherman of Rhode Island. 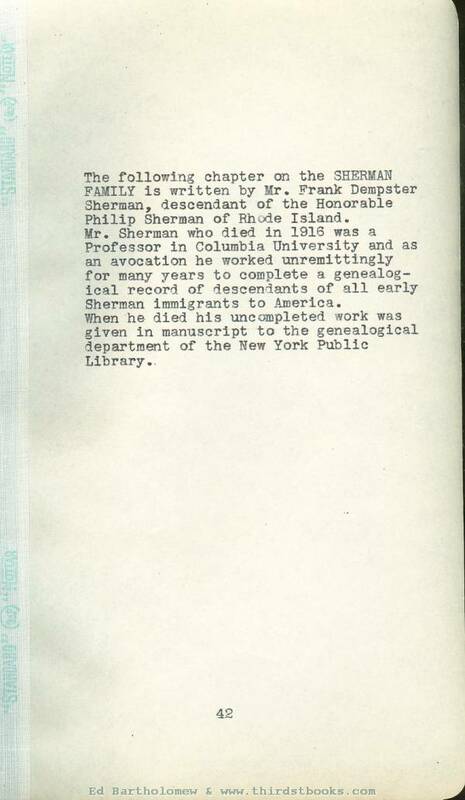 Mr. Sherman who died in 1916 was a Professor in Columbia University and as an avocation he worked unremittingly for many years to complete a genealogical record of descendants of all early Sherman immigrants to America. When he died his uncompleted work was given in manuscript to the genealogical department of the New York Public Library,. 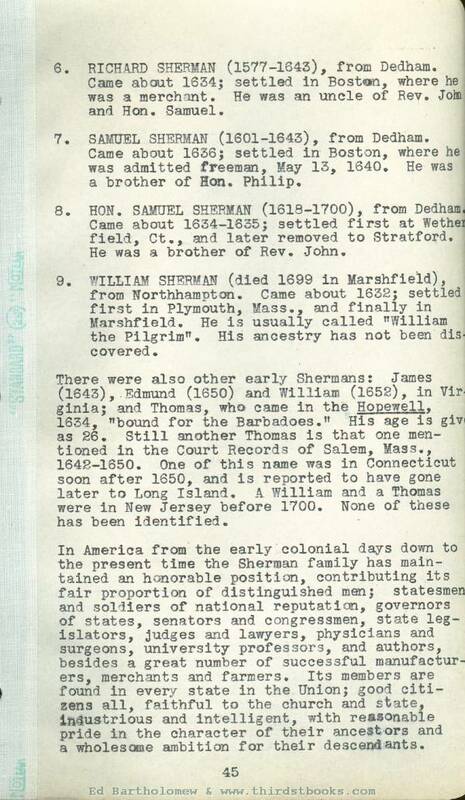 THE SHERMAN FAMILY originated In England. As long ago as the XIIIth Century the parish and court records in many of the counties contain references to persons bearing this name, and it seems reasonable to believe that by continued research the ancestral line eventually may be traced for several generations back of Thomas Sherman of Diss, the first in this pedigree. 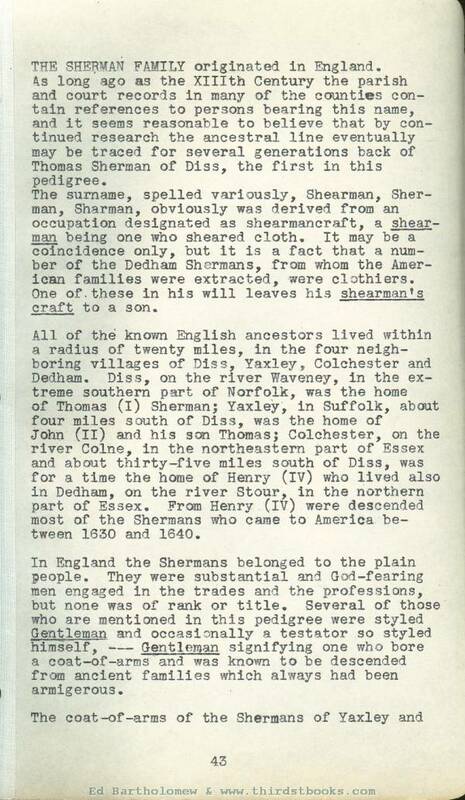 The surname, spelled variously, Shearman, Sherman, Sharman, obviously was derived from an occupation designated as shearmancraft, a shearman being one who sheared cloth. It may be a coincidence only, but it is a fact that a number of the Dedham Shermans, from whom the American families were extracted, were clothiers. One of these in his will leaves his shearman’s craft to a son. All of the known English ancestors lived within a radius of twenty miles, in the four neighboring villages of Diss, Yaxley, Colchester and Dedham. Diss, on the river Waveney, in the extreme southern part of Norfolk, was the home of Thomas (l) Sherman; Yaxley, in Suffolk, about four miles south of Diss, was the home of John (ll) and his son Thomas; Colchester, on the river Colne, in the northeastern part of Essex and about thirty-five miles south of Diss, was for a time the home of Henry (IV) who lived also in Dedham, on the river Stour, in the northern part of Essex. From Henry (IV) were descended most of the Shermans who came to America between 1630 and 1640. In England the Shermans belonged to the plain people. They were substantial and God-fearing men engaged in the trades and the professions, but none was of rank or title. Several of those who are mentioned in this pedigree were styled Gentleman and occasionally a testator so styled himself, — Gentleman signifying one who bore a coat-of-arms and was known to be descended from ancient families which always had been armigerous. Dedham appears on the tombstone of one of those buried In the Dedham churchyard. An illustration of it, accompanied by a brief description, was given in John Gwillin’s "A Display of Heraldrie", published as long ago as 1660. A more detailed description is as follows; Arms, or, a lion rampant, sable, between three oak leaves, vert. Crest: a sea-lion sejant, sable (sometimes or). 1. EDMUND SHERMAN (1572-1641), from Dedham Came probably with one of his sons about 1634-1635. He died in New Haven, Ct. He was the father of Edmund, Reverend John and Honorable Samuel. 2. EDMUND SHERMAN (1599-1673), from Dedham. Came about 1634-1635; settled in Watertown, Mass., where he was admitted freeman, May 25, 1636. He returned to England and died there. 3. REV. JOHN SHERMAN (1613-1685), from Dedham. Came in the ship Elizabeth “from Ipswich the last of April, 1634, bound for New England: Capt. Willis Andrews." In the list of passengers he is "John Sherman, aged 2O yeeres." After a brief stay in Watertown, Mass., he went as pastor to Milford, Ct., where he remained until 1647, when he returned to Watertown. 4. CAPT. 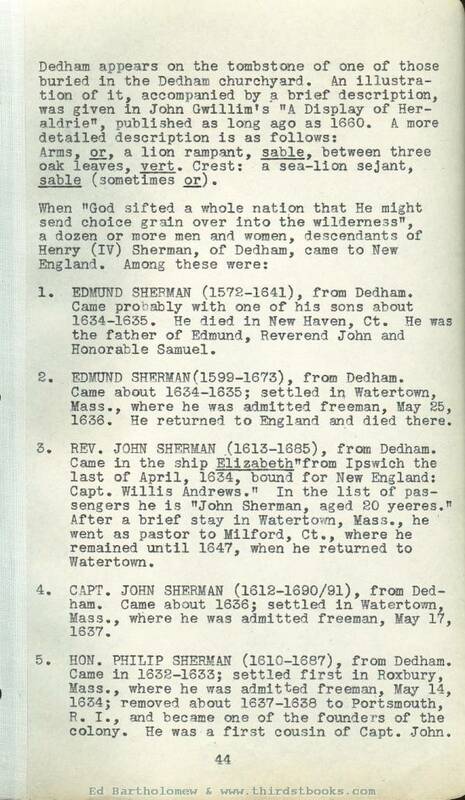 JOHN SHERMAN (1612-1690/91), from Dedham. Came about 1636; settled in Watertown, Mass., where he was admitted freeman, May 17, 1637. 5. HON. PHILIP SHERMAN (1610-1687), from Dedham. Came in 1632-1633; settled first in Roxbury, Mass., where he was admitted freeman. May 14, 1634; removed about 1637-1638 to Portsmouth, R. I., and became one of the founders of the colony. He was a first cousin of Capt. John. 6. RICHARD SHERMAN (1577-1643), from Dedham. Came about 1634; settled In Boston, where he was a merchant. He was an uncle of Rev. John and Hon. Samuel. 7. SAMUEL SHERMAN (1601-1643), from Dedham. Came about 1636; settled in Boston, where he was admitted freeman. May 13, 1640, He was a brother of Hon. Philip. 8. HON. SAMUEL SHERMAN (1618-1700), from Dedham. Came about 1634-1635; settled first at Wetherfield, Ct., and later removed to Stratford. He was a brother of Rev. John. 9. WILLIAM SHERMAN (died 1699 in Marshfield), from Northhampton. Came about 1632; settled first in Plymouth, Mass., and finally in Marshfield. He is usually called "William the Pilgrim", His ancestry has not been discovered. There were also other early Shermans: James (1643), Edmund (1650) and William (1652), in Virginia; and Thomas, who came in the Hopewell. 1634, "bound for the Barbadoes." His age is give as 26. Still another Thomas is that one mentioned in the Court Records of Salem, Mass., 1642-1650. One of this name was in Connecticut soon after 1650, and is reported to have gone later to Long Island. A William and a Thomas were in New Jersey before 1700. None of these has been Identified. In America from the early colonial days down to the present time the Sherman family has maintained an honorable position, contributing its fair proportion of distinguished men; statesmen and soldiers of national reputation, governors of states, senators and congressmen, state legislators, judges and lawyers, physicians and surgeons, university professors, and authors, besides a great number of successful manufacturers, merchants and farmers. Its members are found in every state in the Union; good citizens all, faithful to the church and state, industrious and intelligent, with reasonable pride in the character of their ancestors and a wholesome ambition for their descendants.